Winter Jackets with Hoods can be worn to school and on the playground. Winter Jackets and all Jackets with Hoods must be placed in lockers or hung-up once inside the building. Please consult the Scholar and Family Handbook for complete details. Scholars are required to wear uniforms. 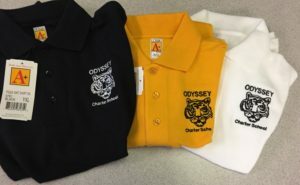 Our embroidered shirt provider is J&R Clothing. You can read or download the full Dress Code.